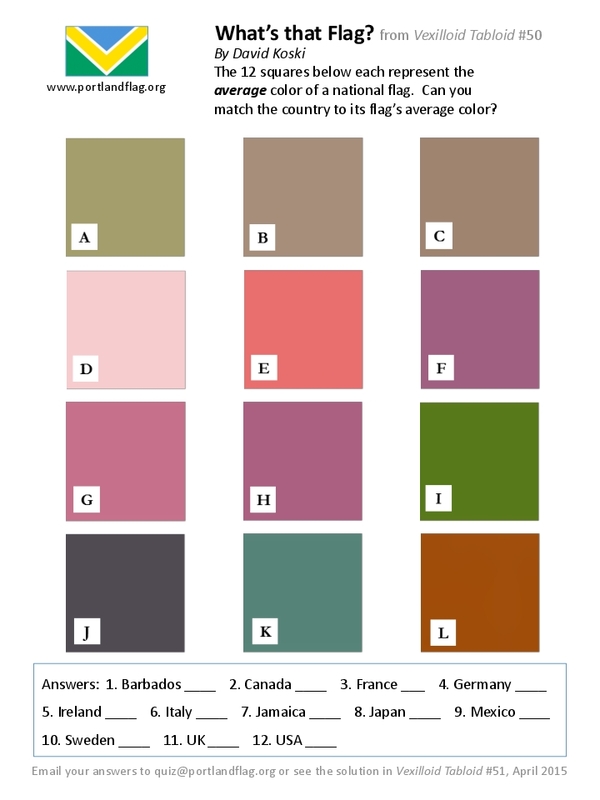 Can you distinguish 12 national flags using only their average color? Email your answers to quiz@portlandflag.org, or wait for the solution to be revealed in the next Vexilloid Tabloid. The Vexilloid Tabloid – 50th edition! The February 2015 edition of our newsletter, The Vexilloid Tabloid, is the fiftieth we’ve published! As always, it’s available as a PDF file on this site. You can also get it and future issues delivered to your inbox by emailing your request to subscribe@portlandflag.org. You’ll also find a most unusual What’s that Flag? quiz from David Koski, notes from the January PFA meeting hosted by Jesse Spillers, the latest on flags in or of Portland in Portland Flag Miscellany, and other items of vexillological interest. 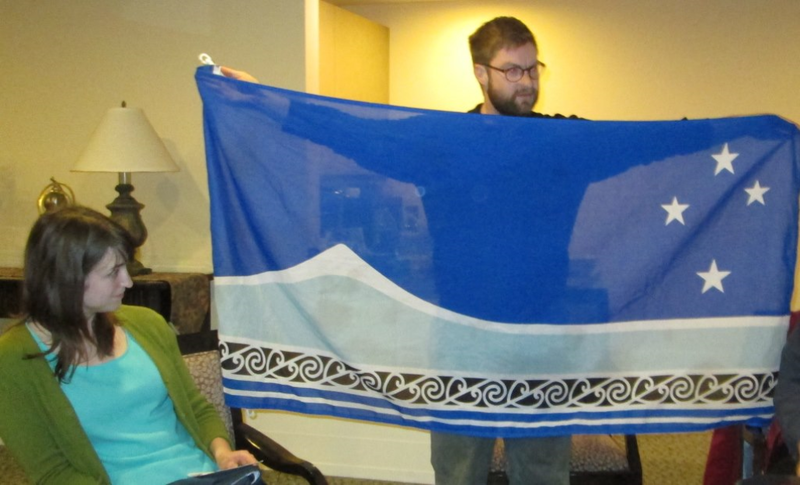 Carl Larson shows the distinctive flag of the Taranaki region of New Zealand, where he spent half a year as a high school exchange student. 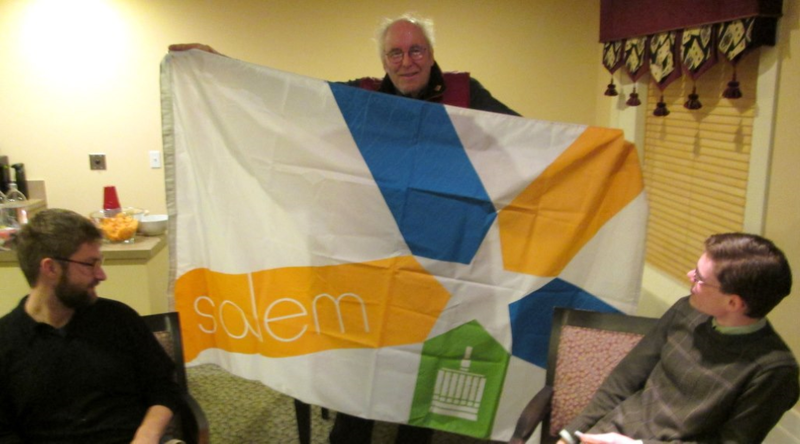 The flag of Salem, Oregon (1972), a recent acquisition by Michael Orelove, features a star and a stylized image of the state capitol’s cupola. 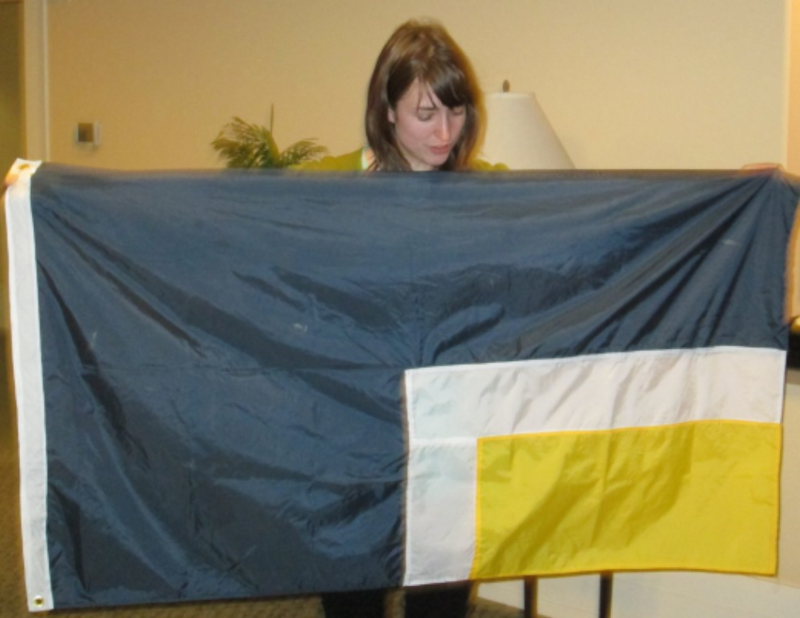 Becky Olson shows her own creation, a flag representing the warmth of Carl Larson’s house in winter. Author SDMPosted on January 17, 2015 March 14, 2015 Categories Vexilloid TabloidTags Vexilloid Tabloid, VexTab50Leave a comment on The Vexilloid Tabloid – 50th edition! The flag of Provo, Utah ranked extremely low (143rd out of 150) in the flag designs evaluated in NAVA’s 2004 American City Flags Survey, eventually leading to an effort in 2013 by Mayor John Curtis to create and adopt a new flag for Utah’s third-largest city. Former flag of Provo (1985-2015). Designed by Stephen Hales Creative Design. It’s important to come up with a good flag design. A good city flag design can become more than just a logo. Have the flag with a circle in the middle with the city’s logo. It doesn’t need classic flag elements. It needs something that extends the city’s identity. One of the designs proposed by the mayor’s office in September 2014. The other design proposed by the mayor’s office in September 2014. Flag of Provo as of January 6, 2015. Designed by Stephen Hales. (1) Hales asserted that his design was consistent with NAVA’s professed principles of good flag design by referencing highly-rated municipal flags in the 2004 American City Flag Survey that included circular logos (like Phoenix, ranked 4th) or what he interpreted as circular logos (like St Louis, ranked 5th). Flag of Phoenix, Arizona. Designed in 1990 by the graphic design firm Smit, Ghomlely, Sanft. Flag of St. Louis, Missouri. Designed in 1962 by art history professor Theodore Sizer (1892-1967). (3) Related to the above, it is clear from this video that the flag was seen as properly subordinate to a larger effort to brand the city: a larger, expensive, professionally designed marketing effort. Seen in this light, it makes perfect sense to defer to the judgement of an advertising professional (not an amateur vexillologist) and to put a great deal of weight in evaluating a design the degree to which it leverages the city’s substantial investment in a logo (and not the degree to which it draws upon more enduring symbols than logos). (4) The discipline of flag design isn’t doing itself any favors, in these political contexts, by branding itself with arcane, hard-to-pronounce, and apparently hard to spell terms like vexillology. (5) Good design by committee, if not impossible, is very hard! In the case of Provo, as in many others (e.g., see the case of Toronto in Vexilloid Tabloid #47), it often comes down to a single person vigorously promoting their own design. At the end of the day and after tiring effort and controversy, Provo has a new flag, one that is almost certainly better than the one it is replacing. It’s possible that the people of Provo will come to love this logo-based flag, and to adopt it as their own, not just as city hall’s. It’s a shame, however, that this populist criteria for defining what makes an enduring, embraceable “good flag” was unable to carry the day against more marketing-based, short-term competitors. A flag for 2015. By Scott Mainwaring. Actually, it’s a flag for any non-leap year that begins on a Thursday. The boundaries aren’t shown, but it’s made from 53 narrow columns (weeks, running from the first week on the hoist edge to the last week on the fly edge) and 7 wide rows (days of the week, with Sunday along the top and Saturday along the bottom). In other words, it’s a calendar turned into a flag. It’s a bit hard to read as a calendar since the order of days goes top to bottom, and then left to right — but that’s the logic of flags, not the logic of text! Author SDMPosted on December 31, 2014 January 18, 2015 Categories PostsTags Flag Design, VexTab50Leave a comment on Happy 2015!